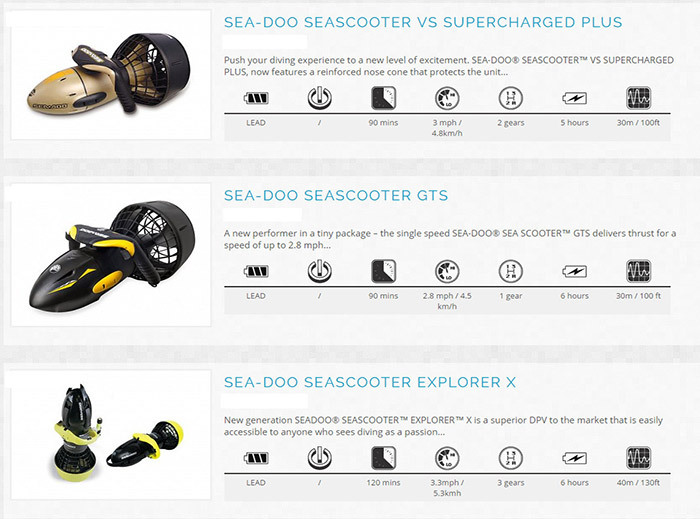 If you want to put some fun and excitement in your dives, then there is no better way than with a Sea Scooter. Techical name is Diver Propulsion Vehicle ( DPV’s) but they are also called underwater scooters, seabob, water scooter, aqua scooters etc. 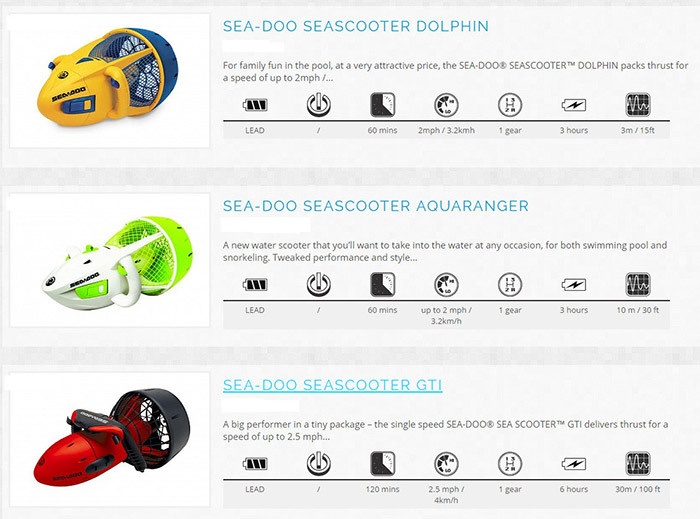 Sea scooters range from small to small submarines, to the hand held underwater scooter. From kids to adults everyone can use them. With Seascooter, you are able to explore the depths of the underwater world. It has an ergonomic design and comes with stabilizing glide fins to help in straight line forward navigation. There’s also a down force spoiler which prevents upward skidding whenever the scooter is accelerating. The water scooter is compact and pretty easy to carry. Seabob scooters have an advanced battery indicator on the handlebar. These handheld sea scooters use an electrical motor to drive a propeller which generates thrust. The diver holds on with two handles. These handles also serve as the accelerator and steering mechanism. Speed is typically around a couple of knots, though some bigger Diver Propulsion Vehicles have more powerful motors and can move faster. Sea scooter can make long dives more comfortable and help to conserve gas during the dive. It is also easier to fight against currents. For very deep dives, they make dragging a number of stage bottles easier for tech divers. Non-tech divers will mostly use the small, compact units. They are cheaper but also have poorer performances. From a practical perspective, water scooters are useful as well. Dives that may feature a risk of strong currents are much safer. Large reefs or wrecks are more manageable on a single dive. The lack of the physical strain on the diver often means extended dive times as well. What are the Types of Sea Scooter? There are several types of underwater scooters. They range from large sled-like types that can be used by two divers at a time, and carry quite a lot of cargo, to simple, compact models, where the diver holds onto the unit and is towed by it. The most common water sea scooter vehicles are those that tow the diver behind the scooter. The diver holds on with both hands onto handles on the bow or stern. The tow-behind propulsion scooter vehicles are efficient since they place the diver above and parallel to the propeller wash. The diver has a harness that also has a D-ring at the front as well as a crotch strap. A releasable metal snap is rigged to the scooter with a tow leash that is clipped on the scooter. 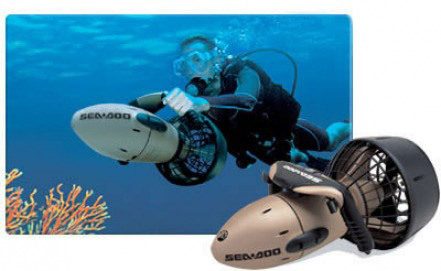 These seabob sea scooters are mostly small and can be handled without any specialized equipment. These are cylindrical or torpedo-shaped vehicles used by one or a number of divers sitting in a hollowed out inside frame. They can carry extra air tanks and have more rudimentary equipment. Such as gyro, magnetic compass, lights, and etc. The first torpedoes were used in World War II, and now similar ones are made for sport or work divers. 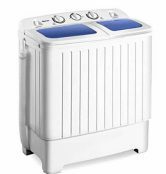 These units are too cumbersome and bulky to be operated by individuals. These Diver Propulsion Vehicles are unpowered and usually towed by a surface boat using ropes. They have surfaces in the shape of airfoil that provide downward force when pulled. The diver holds the board and uses an aerofoil to keep it submerged. By changing the angle between ‘direction of speed’ and ‘direction of board’s longitudinal axis’, diver adjust diving depth. The boards got their name from the manta ray fish. Seadoo Seascooter VS Supercharged test in empty pool. #Buoyancy – is an upward force exerted by a fluid that opposes the weight of an immersed object. In sea scooters it is usually a neutral to slight positive depending on the model. Slight positive buoyancy ensures that if scooter is left unattended, it will slowly reach the surface. Neutral buoyancy is used mostly for professional underwater scooters. When left unattended but connected to the diver, it will float freely in the water and will not disturb the diver at work by pulling him up or down. 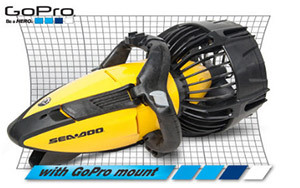 Most higher end sea scooters will come with attachment points or removable cavities that allow the user to adjust the buoyancy easily with weights. Strategically placed drain holes allow water to freely enter and exit the ballast space making the Seascooter automatically assume neutral buoyancy when submerged, and expel water as soon as it hits the surface. #Size of sea scooters – Size varies from small pool toys for kids such as the Sea-Doo Dolphin and Sea-Doo Aqua Ranger to professional underwater scooters. Small scooters weigh 12 pounds and can pull single diver at limited speed and usually have limited endurance (30 -90 minutes maximum, maybe a little bit more if not pushed too hard). Larger underwater scooters weigh up to 20-30 pounds and can easily be handled with one adult on the boat deck or shoreline area. #Depth Range – This can vary from a few feet for the smaller sea scooters to several meters for the higher end professional scooters. At 40 meters is a safe limit for scuba diving using ordinary air for breathing. Even then, a diver must use diving tables for decompression. 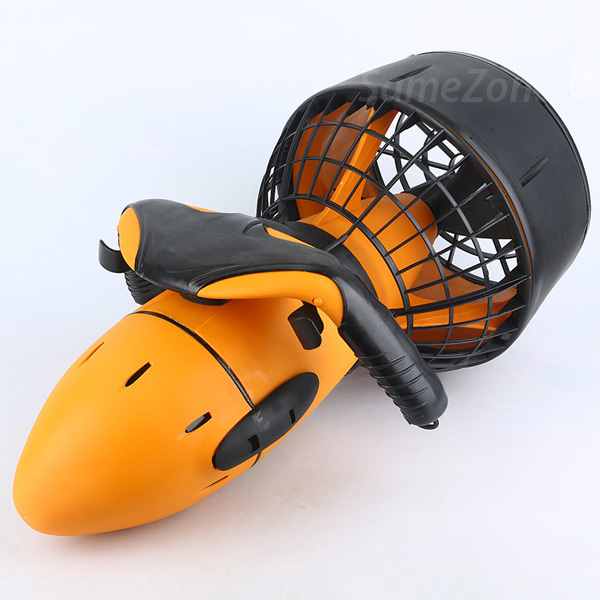 If you are a casual diver, then use water scooters according to your maximum diving depth and be very careful. #Power output – Batteries can vary from a few hundred watts to few kilowatts. The stronger engine doesn’t mean more noise. Expensive models usually have better acoustic insulation, better bearings and better and larger propellers. Smaller underwater scooters mostly have high-pitch sound due to the use of smaller, faster rotating electric motor and propeller. The energy source is almost exclusively batteries with the most common batteries being the NiCd, NiMH, LiPo and various lithium batteries. This depends on the size of the scooter, battery type, size, capacity, and the way the scooter is used. When scooter is pushed heavily and driven hard, it drains the battery fast, with running times often less than 10-15 minutes for cheap models. On the other hand, big scooters equipped with lithium batteries and large propellers, when used for slower diving around, can last for hours. Most of these devices have rechargeable batteries that are easily replaced. Always a good idea to have multiple batteries on a charge to help extend your scooter usage. #Prices – Price can vary from $100 up to several thousands (or even more) dollars. 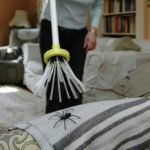 Cheap ones are barely more than pool toys, while expensive ones are professional grade equipment that can withstand severe usage in a more hostile environment. Need that extra kick underwater? Or just looking to have fun? Check out underwater propulsion devices which are a cool addition to your gadget collection whether it is for kids in the pool, snorkelling in the ocean or for serious diving. For family fun in the pool, at a very attractive price, the Sea-Doo Dolphin Scooter delivers speed up to 2mph / 3.2km/h in a very compact, lightweight design. With safety features including protective grilles, auto shut-off, dual trigger control and positive buoyancy, the dolphin is ideal for every child, or child at heart. It is ideal for kids, holidays or swimming pools. This is new water scooter that you’ll want to take into the water for any occasion. It is intendend for both swimming pool and snorkeling. Tweaked performance and style will get you propelling through the water in style. 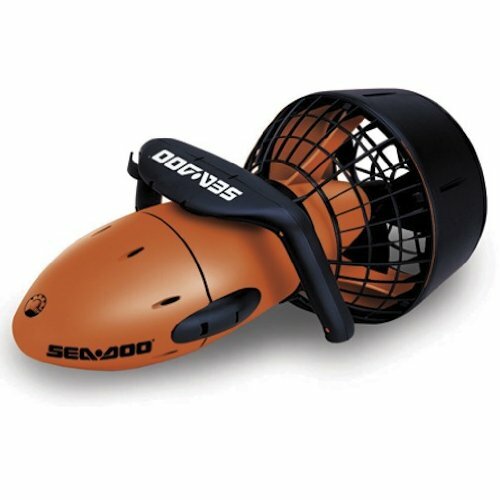 A big performer in a tiny package, the Sea-Doo Seascooter GTI is an ideal accessory for scuba divers, snorkelers, and anyone else looking to get around in the waves. The dive propulsion vehicle runs at a speed of up to 2.5 miles per hour and dives as deep as 100 feet, helping you navigate your way through choppy currents while exploring your favorite dive spot. Snorkelers will also get a kick out of the GTI, which works as well on the surface as it does underwater. The GTI is light enough at 18 pounds (including battery) to carry in one hand, making beach diving a reality. 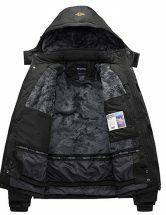 Other details include waterproof circuitry that protects against accidental flooding, adjustable buoyancy, and a run time of two hours per charge with normal use. The GTI, which measures 23.5 by 14.6 by 12.2 inches (W x H x D), carries an 180-day warranty on parts and labor. 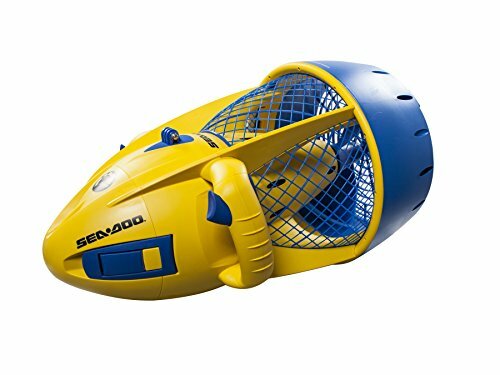 This seascooter runs at a speed of up to 3 miles per hour at a depth of up to 100 feet. You can slow down to view a shipwreck more carefully or go faster to get to your destination. Thanks to the lightweight housing, which weighs just 18 pounds, the Vs. Supercharged Plus is a very easy to transport out of the water. Other features include a waterproof construction that prevents accidental flooding, a reinforced nose cone that protects the body from rough handling, adjustable buoyancy, and a runtime of up to 1.5 hours per charge. This dive propulsion vehicle was rated No.1 overall by Diving Science and Technology (DSAT). Speed Control, and long lasting Lithium Ion Battery with an L.E.D Battery Life Indicator. It comes with newly designed rotational speed adjustment function and hands-free riding style. 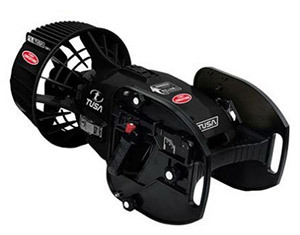 The TUSA SAV 7 EVO2 decreases fatigue, reduces air consumption, and allows a diver to go further and faster in a variety of conditions while extending their time in underwater. 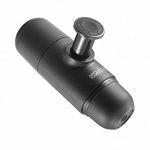 The upgraded Variable Speed Control is at your fingertips for a greater diving experience while giving you complete control of speed. Transportation options like the fold out wings on both sides of the saddle allows additional divers to tag along. This new innovative DPV set the standard and raised the bar in tow behind vehicles. It comes with 45lbs of thrust and a depth rating of 656ft. With removable trim weights you have the perfect trim for salt or fresh water diving. The H-160 is operable with one hand and has a trigger switch that allows divers to vary between power settings of 50%, 75% or 100%. You select the power setting and use the thumb lock to set the underwater cruise control. All of these features make the H-160 the DPV of choice for cave, wreck, and recreational diving. 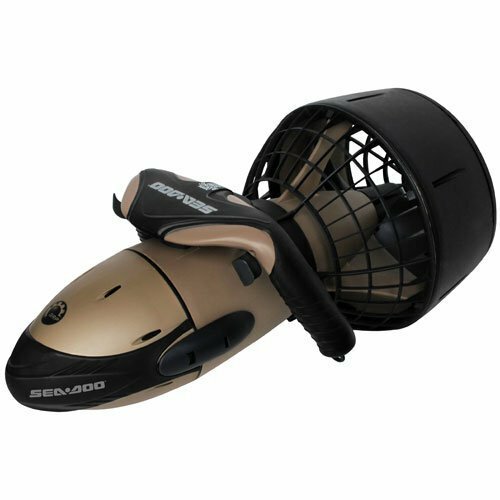 The Sea-Doo Seascooter RS2 is a snorkeler’s or divers dream come true. With close to 1.5 hours of run time and a top speed just under four mph this outstanding scooter will get there quicker and with less effort to your favorite dive spot. 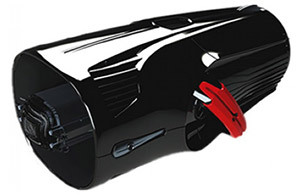 The Seascooter RS 2’s offers speed control triggers, allowing the diver to toggle between gears to adjust the speed and acceleration of the scooter. This nice feature allows the scooter’s speed to be easily controlled all within the reach of the divers fingers. 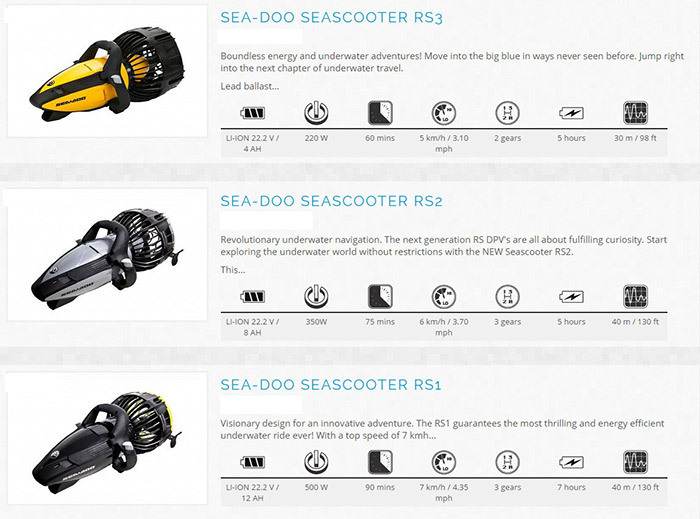 The Sea-Doo Seascooter RS3 is a do it all seascooter. It can endure 60 minutes of run time and a top speed three mph. Comes with two-speed transmission so you can cruise around at a slow crawl, or kick it into high gear to get to your destination. 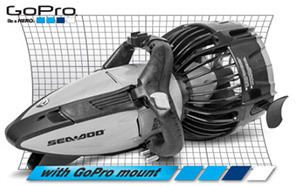 The Blade Fish XT delivers high performance at blazing speeds. If you want speed you’ve got it with the 3 speed BladeFish XT. At a total weight of only 14 pounds this underwater sea scooter is amazingly portable yet still very powerful considering. It features light and fast charging 20 cell Lithium-Ion battery that gives you a run-time of up to 90 minutes. The Li-ion battery can be fully recharged in only 4 hours but you can “Quick Charge” it in a little over an hour. Sea scooters are becoming more popular with the underwater enthusiasts who want the excitement of extra propulsion. From kids to adults, anybody can enjoy and create beautiful underwater sea scooter videos. Do you want to put some fun and excitement in your dives? Then there is no better way than with underwater scooter. Sea Scooter is a fun investment, but for a better underwater experience, you will need to pay more to get better features.